Nel primo volume di una raccolta di broadsides conservata presso gli archivi dell’Università di Newcastle upon Tyne, Inghilterra. Lament on the transportation of criminals to the colonies. At the time this song was printed, the British penal code was extremely harsh. In the late eighteenth century Parliament had dramatically increased the number of capital offences and it was said that there were more executions annually in England than in all the rest of Europe. In Newcastle until well on into the second quarter of the nineteenth century, prisoners were hanged at Morpeth, Durham and Newcastle, before a great crowd of spectators, it being usual practice at Newcastle to hand over the body afterwards to the doctors at the Surgeon's Hall for dissection. Transportation to colonies, in particular Australia, became extremely popular during the nineteenth century, reaching its peak in the 1830s. 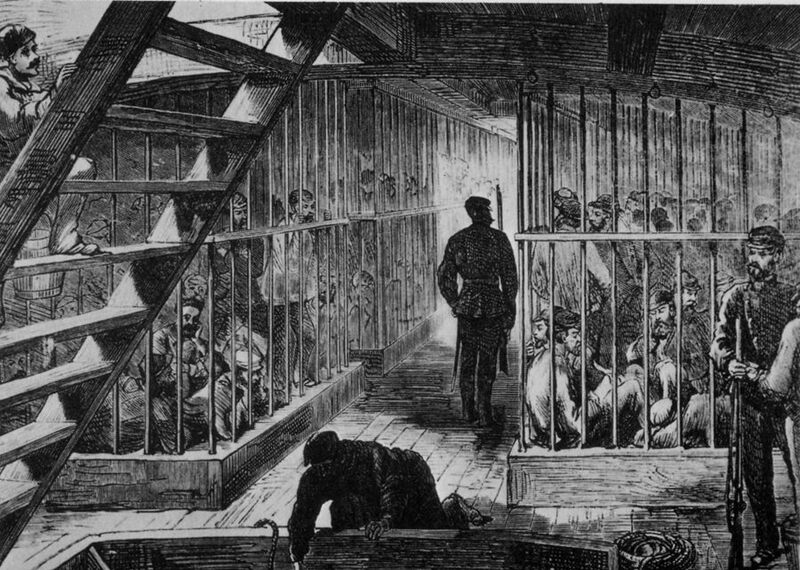 Four out of five death sentences were transmuted to transportation, the practice continuing until the early 1850s, when Sydney and Melbourne refused to take anymore convicts. Prisoners in Newcastle, who were condemned to this fate at the local assizes, were retained at Newgate gaol, or in the basement of the keep whilst they awaited transfer to a transportation ship. Lamentazione sul trasporto dei condannati verso le colonie. All’epoca della pubblicazione di questa canzone, il 1842, il codice penale britannico era estremamente duro. Alla fine del XVIII secolo, il Parlamento aveva notevolmente aumentato il numero dei reati capitali e si diceva che ci fossero più esecuzioni ogni anno in Inghilterra che in tutto il resto d'Europa. Nel nord est, fino fino alla metà del XIX secolo, i condannati venivano impiccati a Morpeth, Durham e Newcastle, davanti a grandi folle di spettatori, e a Newcastle era prassi che i corpi fossero poi lasciati ai chirurghi per la dissezione. Il trasporto verso le colonie, in particolare l’Australia, divenne cosa comune nel corso del XIX secolo, raggiungendo il suo picco nel 1830. Quattro su cinque condanne a morte furono commutate nel trasporto e la pratica continuò fin oltre il 1850, quando Sydney e Melbourne rifiutarono di accogliere altri detenuti. A Newcastle i prigionieri, condannati a quel destino dai tribunali locali, venivano rinchiusi della prigione di Newgate, o nel seminterrato del mastio, in attesa del trasferimento su di una nave per il trasporto. 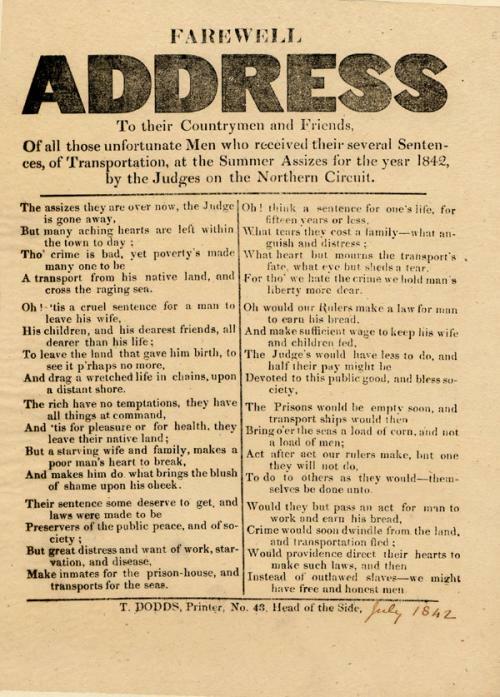 To their countrymen and friends, of all those unfortunate men who received their several sentences of transportation, at the Summer Assizes for the year 1842, by the judges on the Northern Circuit. A transport from his native land, and cross the raging sea. And drag a wretched life in chains, upon a distant shore. And makes him do what brings the blush of shame upon his cheek. Devoted to the public good, and bless society. To do to others as they would themselves to be done unto. Instead of outlawed slaves–we might have free and honest men.